How do you try to identify an unknown mineral? If you are like most folks you start with color, which can help, but can also mislead. Trace elements and other types of inclusions can alter the color or many minerals. Does it have crystal faces? Maybe, but often not. Can you see a cleavage direction? Can you even distinguish crystal faces from cleavage? Calcite has rhombohedral cleavage, galena is cubic, but then fluorite is a cubic crystal with octahedral cleavage. That isn’t even fair. Luster helps with metallic minerals. Hardness can be helpful, but no one wants to scratch a prize find. 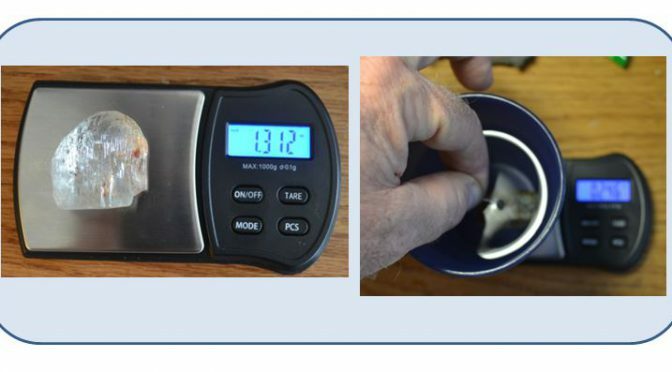 What about density, or more accurately specific gravity (sg). If it is magnetite or galena you can tell it is dense when you pick it up, but what about other minerals with specific gravity closer to the common minerals? Or heavy minerals that are not magnetic? Is there a method to easily measure specific gravity?